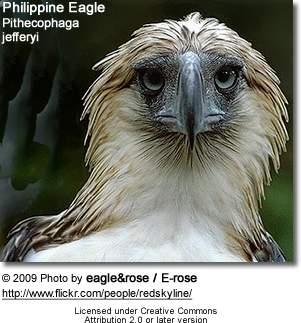 The Philippine Eagle, Pithecophaga jefferyi, also known as the Great Philippine Eagle or Monkey-eating Eagle, is among the tallest, rarest, largest and most powerful birds in the world. A bird of prey belonging to the family Accipitridae, it is also known as "Haribon" or "Haring Ibon," which means "Bird King". Its local name is banog. 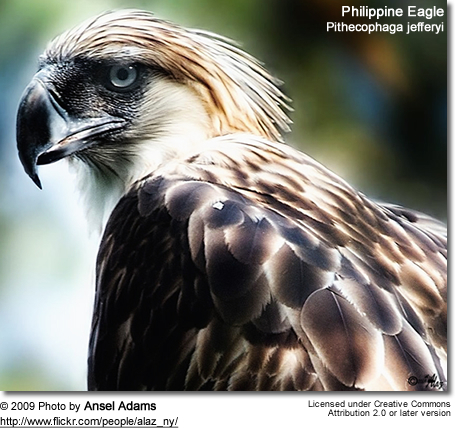 The Philippine Eagle's nape is adorned with long brown feathers that form a shaggy crest. These feathers give it the appearance of possessing a lion's mane, which in turn resembles the mythical gryphon. The eagle has a dark face and a creamy-brown nape and crown. 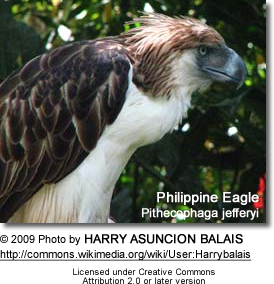 The back of the Philippine Eagle is dark brown, while the underside and underwings are white. The heavy legs are yellow with large, powerful dark claws, and the prominent large, high-arched, deep beak is a bluish-gray. The eagle's eyes are blue-gray. Juveniles are similar to adults except that their upperpart feathers have pale fringes. The average female is about 102 centimeters (3.36 ft) long and weighs about 7 kilograms (15.5 lb). The adult male is about 10 to 20% smaller and averages at about 91 centimeters (3 ft) and 5 kilograms (11 lb). The Philippine Eagle is the world's largest living eagle in terms of length. The species has a wingspan of approximately 2 meters (6.6 ft). The wings of this eagle are shorter than large eagles of open country (such as the Martial Eagle, Wedge-tailed Eagle and Steller's Sea Eagle, but are quite broad and have a greater surface area than any other eagle. The most frequently heard noises made by the Philippine Eagle are loud, high-pitched whistles. Additionally, juveniles have been known to beg for food by a series of high-pitched calls. The Philippine Eagle is endemic to the Philippines and can be found on four major islands: eastern Luzon, Samar, Leyte and Mindanao. The largest number of eagles reside on Mindanao, with between 82 and 233 breeding pairs. Only six pairs are found on Samar, two on Leyte, and a few on Luzon. It can be found in Northern Sierra Madre National Park on Luzon and Mount Apo and Mount Kitanglad National Parks on Mindanao. Some Palawan natives have claimed that the Philippine Eagle does exist in the island province. Some are under care of the Palawan Crocodile Farm. This eagle is found in dipterocarp and mid-montane forests, particularly in steep areas. Its elevation ranges from the lowlands to mountains of over 1,800 meters (5,905 ft). It is estimated that only 9,220 square kilometers (2,280,000 acres) of old growth forest remain in the bird's range. However, its total estimated range is about 146,000 square kilometers (56,000 sq mi). Evolution in the Philippine islands, without other predators, made the eagles the dominant hunter in the Philippine forests. Each breeding pair requires a large home range (of 25 to 50 square miles) to successfully raise a chick, and thus the species is extremely vulnerable to the regularly occurring deforestation. The species' flight is fast and agile, resembling the smaller hawks more than similar large birds of prey. Juveniles in play behavior have been observed gripping knotholes in trees with their talons and, using its tail and wings for balance, inserting its head into a tree cavity. Additionally, they have been known to attack inanimate objects for practice as well as attempt to hang upside down to work on their balance. As the parents are not nearby when this occurs, it has been suggested that they do not play a role in teaching the juvenile to hunt. Life expectancy for a wild eagle is estimated to be anywhere from 30 to 60 years. A captive Philippine Eagle lived for more than 41 years old in a zoo in Rome. However, it is believed that wild birds on average live shorter than captive birds. This eagle was initially known as the Monkey-eating Eagle because it was believed to only feed on monkeys; this has proved to be inaccurate. The Philippine Eagle's prey varies from island to island as available species vary, especially between Luzon and Mindanao. This is due to the islands being in different faunal regions. For example, Philippine flying lemurs, which are the preferred prey in Mindanao, are absent in Luzon. It is unknown what the primary prey for the species on Luzon is. The Philippine Eagles prefer flying lemurs and Asian Palm Civets, but they also occasionally eat other small mammals, reptiles and birds, such as snakes, monitor lizards, hornbills, owls, and even other birds of prey. There have additionally been reports of this eagle capturing young pigs and small dogs. It is estimated that the flying lemur could make up 90% of the bird's diet in some locations. The Philippine Eagle also infrequently eats monkeys. Pairs sometimes hunt troops of monkey cooperatively, with one bird perching nearby to distract the primates so that the other can soar in unnoticed for the kill. 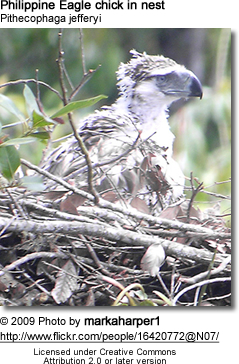 The complete breeding cycle of the Philippine Eagle lasts for two years. The female sexually matures at five years of age and the male seven. Like most eagles, the Philippine Eagle is monogamous. Once paired, a couple remains together for the rest of their lives. However, if one bird of a pair dies, the survivor often finds a new mate to replace the one lost. The beginning of courtship is signaled by nest-building and the eagle remaining near its nest. Aerial displays also play a major role in the courtship. These displays include paired soaring over a nesting territory, the male chasing the female in a diaganol dive, and mutual talon presentation, where the male presents his talons to the female's back and she flips over in mid-air to present her own talons. Advertisement displays coupled with loud calling have also been reported. The willingness of an eagle to breed is displayed by the eagle bringing nesting materials to the bird's nest. Copulation follows and occurs repeatedly both on the nest and on nearby perches. The earliest courtship has been reported in July. Breeding begins between September and February; birds on different islands, most notably Mindanao and Luzon, begin breeding at different ends of this range. The amount of rainfall and population of prey may also affect the breeding season. The nest is normally built on an emergent dipterocarp, or any tall tree with an open crown, in primary or disturbed forest and may be nearly 1.5 meters (5 ft) across and about 30 meters (99 ft) above the ground. The eagle's nest resembles a huge platform made of sticks. The eagle frequently reuses the same nesting site for several different chicks. Eight to ten days before the egg is ready to be laid, the female is afflicted with a condition known as egg lethargy. In this experience, the female does not eat, drinks lots of water, and holds its wings droopingly. The female typically lays one egg in the late afternoon or at dusk, although occasionally two have been reported. If an egg fails to hatch or the chick dies early, the parents will likely lay another egg the following year. Copulation may last a few days after the egg is laid to enable another egg to be laid should the first one fail. The egg is incubated for 58 to 68 days after being laid. Both sexes participate in the incubation, but the female does the majority of incubating during the day and all of it at night. Both sexes help feed the newly hatched eaglet. Additionally, the parents have been observed taking turns shielding the eaglet from the sun and rain until it is seven weeks old. The young eaglet fledges after four or five months. The earliest that a juvenile has been observed making a kill is 304 days after hatching. However, the parents will care of the eaglet for a total of twenty months. The 2008 Red List listed this species as critically endangered. The International Union for the Conservation of Nature believes that between 180 and 500 Philippine Eagles survive in the Philippines. They are threatened primarily by deforestation through logging and expanding agriculture. Old growth forest is lost at a high rate, and most of the eagle's forest in the lowlands is owned by logging companies. Mining, pollution, exposure to pesticides that affect breeding, and poaching are also major threats. Additionally, they are occasionally caught in traps laid by the local people for deer. Though this is no longer a major problem, the eagle's numbers were also reduced by being captured for zoos. Charles Lindbergh, best known for crossing the Atlantic alone and without stopping in 1927, was fascinated by this eagle. As a representative of the World Wildlife Fund, Lindbergh travelled to the Philippines several times between 1969 and 1972, where he helped persuade the government to protect the eagle. In 1969, the Monkey-eating Eagle Conservation Program was started to help preserve this species. In 1992, the first Philippine Eagles were born in captivity through artificial insemination; however, it wasn't until 1999 that the first naturally bred eaglet hatched. 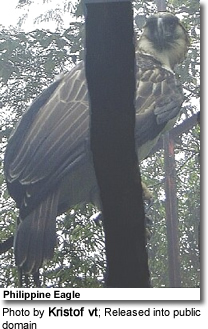 The first captive-bred bird to be released in the wild, Kabayan, was released in 2004 on Mindanao; however, he was accidentally electrocuted in January 2005. Another eagle, Kagsabua, was released March 6, 2008, but was shot and eaten by a farmer. However, killing this critically endangered species is punishable under Philippine law by twelve years in jail and heavy fines. Its numbers have slowly dwindled over the decades to the current population of 180 to 500 eagles. A series of floods and mud slides, caused by deforestation, further devastated the remaining population. The Philippine Eagle may soon no longer be found in the wild, unless direct intervention is taken. The Philippine Eagle Foundation of Davao City, Mindanao is one organization dedicated to the protection and conservation of the Philippine Eagle and its forest habitat. The Philippine Eagle Foundation has successfully bred Philippine Eagles in captivity for over a decade and conducted the first experimental release of a captive-bred eagle to the wild. The foundation has 32 eagles at its center, of which 18 were bred in captivity. Ongoing research on behavior, ecology and population dynamics is also underway. In recent years protected lands have been established specifically for this species, such as the 700 square kilometers (170,000 acres) Cabuaya Forest and the 37.2 square kilometers (9,200 acres) Taft Forest Wildlife Sanctuary on Samar. However, a large proportion of the population is found on unprotected land. The Philippine Eagle was named the national bird of the Philippines in 1995 by President Fidel V. Ramos under Proclamation No. 615. This eagle, because of its size and rarity, is also a highly desired bird for birdwatchers. The Philippine Eagle has also featured on at least twelve stamps from the Philippines, with dates ranging from 1967 to 2007. The species was discovered in 1896 by the English explorer and naturalist John Whitehead, who observed the bird and whose servant, Juan, collected the first specimen a few weeks later. The skin of the bird was sent to William Robert Ogilvie-Grant in London in 1897, who initially showed it off in a local restaurant and described the species a few weeks later. Upon its discovery, the Philippine Eagle was first called the Monkey-eating Eagle because of reports from natives of Bonga, Samar where the specie was first discovered that it preyed exclusively on monkeys; from these reports it gained its generic name, from the Greek pithecus ("ape or monkey") and phagus ("eater of"). The specific name commemorates Jeffery Whitehead, the father of John Whitehead. Later studies revealed, however, that the alleged Monkey-eating Eagle also ate other animals such as colugo, civets, large snakes, monitor lizards, and even large birds like hornbills. This, coupled with the fact that the same name applied to the African Crowned Hawk-eagle and the South American Harpy Eagle, resulted in a presidential proclamation to change its name to Philippine Eagle in 1978, and in 1995 it was declared a national emblem. This species has no recognized subspecies. A recent study of the Philippine Eagle's DNA suggests that the bird has a unique evolutionary history. Its genetic sequence differs from those of other large eagles. Researchers from the University of Michigan analyzed the DNA isolated from blood samples of the Philippine Eagle. The sequence was then compared to those of the Harpy Eagle, Crested Eagle, and the New Guinea Harpy Eagle. All three are related genetically but they are not closely related to the Philippine Eagle. These species were once believed to be closely related due to their similar sizes, habitat, and habits; however, these similarities are now believed to be the result of convergent evolution. 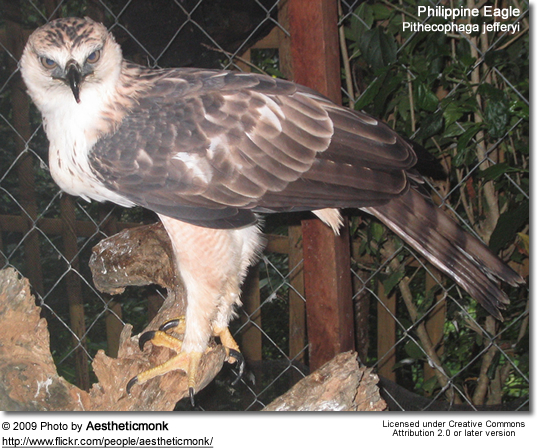 It is actually believed that the closest relative to the Philippine Eagle may be the much smaller snake eagles.